This post was written by the research team of WeChatscope, a censorship monitor project, led by Dr. King-wa Fu, at The University of Hong Kong. With more than 1.0825 billion  individual users, along with more than 20 million  registered public accounts, WeChat has the largest number of domestic users and the most extensive coverage of any social media service in China. As such, it has become a chief component of China's rigorous censorship regime. In 2017, our team  at the University of Hong Kong built a technical web “scraping” system for studying censorship on WeChat's publicly accessible pages. Throughout 2018, we tracked more than 4,000 public accounts covering daily news and preserved censored posts in a publicly accessible database, WeChatscope. This article is the second in a partnership series  with Global Voices. 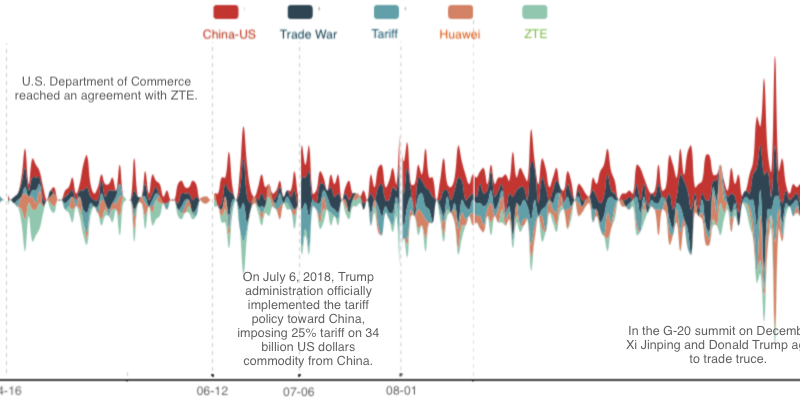 The most censored topic in the 2018 WeChatscope dataset was the China-US trade war. This high-profile conflict has triggered heated public discussions on Chinese social media, with state-affiliated media outlets covering the news extensively and accusing the US of preaching unilateralism and protectionism. Many of these outlets publish directly to WeChat. As such, thousands of stories about the China-US trade conflict posted on WeChat public accounts are removed by WeChat operators shortly after publication. These trends indicate that the channeling of public opinion and censoring of independent expression go hand-in-hand. Our results are also consistent with the findings of other organizations. In June 2018, China Digital Times  revealed that Chinese propaganda authorities issued a detailed set of instructions to media outlets after China announced a 25 percent tariff on 659 products, in retaliation for tariffs set by the US Trade Representative. When one cross-references the censorship timeline (figure III) and the trade war timeline , a pattern emerges. Upsurges in censorship all took place in close proximity to the peak moments of the China-US confrontation. 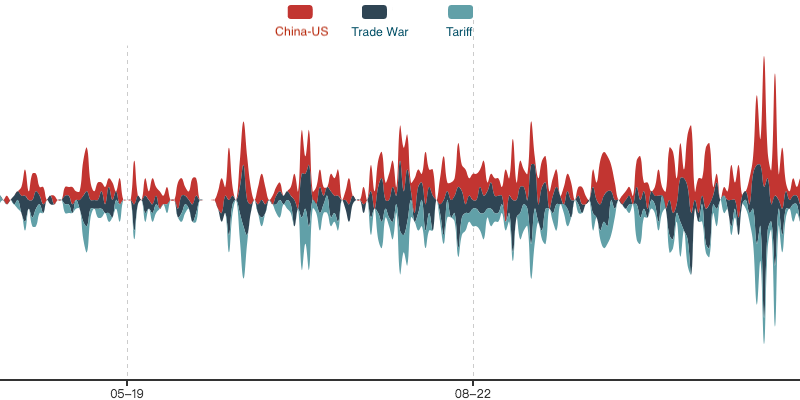 In figure 1 (below), the first surge appears after US President Donald Trump announced on March 22 that the US would impose a tariff on USD $60 billion worth of goods imported from China. On April 2, the Chinese Ministry of Commerce reacted with a counterattack, levying a tariff on 128 kinds of imported goods from the US. From April until the end of May, the curves measuring censorship and the intensity of trade talks are mirror images of one another. There was a clear surge of censorship after the US Department of Commerce concluded that Chinese telecom company ZTE violated US sanctions on April 16. This subsided and then re-emerged in early May, when the US demanded that China reduce the trade gap by USD $200 billion within two years. Many posts censored during this period contained the views of economic experts such as Gao Shanwen, a researcher from the People's Bank of China, and real estate tycoon Ren Zhiqiang. 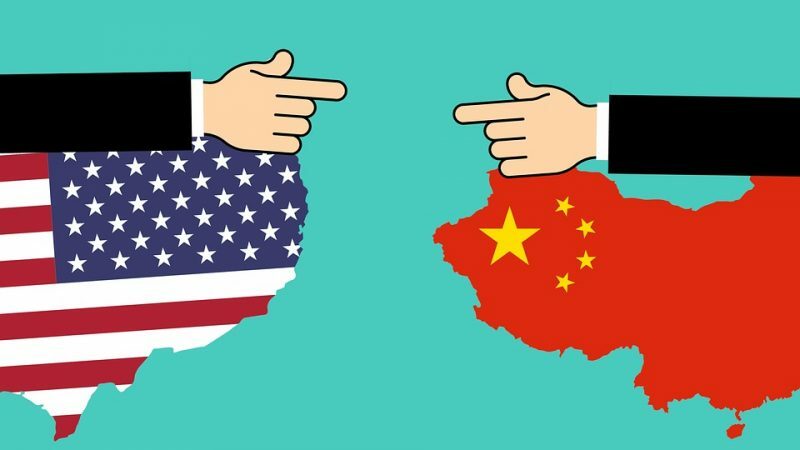 Gao Shanwen's post “Deep friction between China and the United States” (中美贸易摩擦深处的忧虑 ), removed from WeChat on August 2, analysed key conflicts, from global trade to technology markets, between the two countries. Ren Zhiqiang discussed the Sino-US trade war (任志强谈中美贸易战，能不能听懂是你们的事 ) and criticized China's closed-door policy of recent years. This post was removed from WeChat on October 17. But they were in good company — pro-Chinese government nationalistic pieces were also censored. A piece entitled “Are China and the United States still in the same boat?” (北方青杨：中美还在一条船上吗？) , which boasted about China's strength in resisting US hegemony, was also removed from WeChat on August 18. Figure II. The word “tariff” is central to the censorship of trade war. Another spike took place in late June after China announced a 25 percent tariff on 659 products as a retaliation against the US tariff-imposition list. 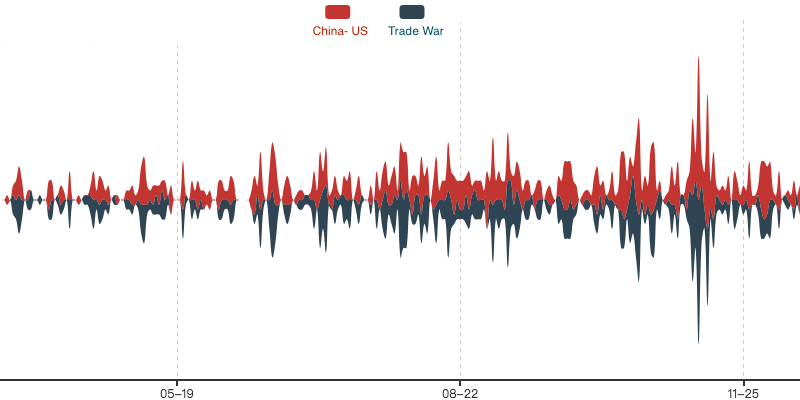 The timing of the spike coincided with the propaganda department's issuing of censorship instructions on the China-US trade war. The most frequently mentioned keywords to appear in the censored posts are “tariff” (see figure II), “Huawei” and “ZTE” (figure III). Censored keywords “tariff”, “ZTE” and “Huawei” in relation to China US trade war censorship. Another spike was seen around July 6 after the Trump administration imposed a China-specific tariff list that placed a 25 percent tariff on 818 imported Chinese products valued at USD $34 billion. The overall volume of censorship remained at high levels between July and September, as both China and the US kept introducing new tariff lists. Stories about the negative impact of the war in China were also a top target for censorship on WeChat. A number of posts about the fall of the Chinese stock market in June 2018 were deleted. One post entitled “Trump imposed China's 200 billion commodity tariffs. 2 trillions in the stock market just evaporated overnight!” (特朗普再收中国2000亿商品关税 股市一夜蒸发2万亿！千股跌停 ) was published on WeChat on June 20 and removed the next day. After China cancelled trade talks with the US on September 22 and issued a white paper accusing Washington of economic bullying, overall levels of censorship dropped slightly, leaving some space for channeling public opinion against US economic power. But then, the sharpest spike in censorship appeared in early November when the US and China resumed trade talks in a phone call between US Treasury Secretary Steve Mnuchin and Chinese Vice Premier Liu He. This particular spike was likely intended to cool down the propaganda war against the US and to prepare the public for a deal. At the G20 summit on December 1, 2018, the heads of both sides finally reached an agreement on a 90-day armistice negotiation period. After that, the most commonly censored content in our dataset was about the arrest of Huawei CFO Meng Wanzhou in Canada. All told, it is clear that Chinese authorities have been very careful in maneuvering public sentiment on WeChat. Across the board, they have worked to protect China's image as a strong country and to blame the US for triggering the trade war. Yet they have also worked to prevent excessive resentment against the US, for fear that the public would view any compromise by the Chinese government as a defeat. In our next post, we will take a closer look into the ZTE and Huawei's censorship pattern. Read more from our Censored on WeChat  series.